105 is just one of the ways you can contact your network operator. They can still be contacted directly by phone on their 0800 number or via their website – and most can be reached through social media too. 105 is a free service for people in England, Scotland and Wales, and you can call the number from most landlines and mobile phones. It doesn’t matter who you choose to buy your electricity from - anyone can call 105. You can also call 105 if you spot damage to electricity power lines and substations that could put you, or someone else, in danger. If there’s a serious immediate risk, call the emergency services too. To find out more, visit powercut105.com. What should I do during a power cut? Switch off all electrical appliances that shouldn’t be left unattended, ready for when the power comes back on. Leave a light on so you know when the power cut has been resolved. Check to see if your neighbours are okay. Contact your electricity network operator to report the power cut, either by calling 105 or via their other channels. 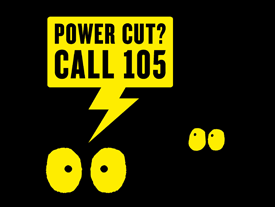 Visit powercut105.com for details of your local network operator. How can I prepare for a power cut? Keep a torch handy – it’s much safer than using candles. Get a battery-powered or wind-up radio (useful for keeping up to date with relevant local news). Keep warm – keep a blanket and warm clothing handy, and fill a vacuum flask or hot water bottle. Stock your cupboard with food and drink that doesn’t require electricity to prepare it. Keep your mobile phone and laptop fully charged. Check your network operator’s website or social media channels for updates. Can I use my phone during a power cut? Cordless phones probably won’t work during a power cut. They take their power from the mains and most don’t have battery back-up. Traditional corded phones will work – you might want to keep one handy so you can plug it in and make phone calls if you have a power cut. In most cases, mobile phones will work if they are charged. I’m on the Priority Services Register. Should I now call 105? The Priority Services Register is for people who might need extra support during a power cut; for example, people who need electricity for vital medical equipment. If you are on the Register and you have a power cut, you should continue to call the phone number that you have been given.